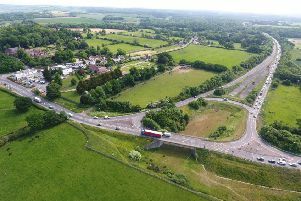 A two-vehicle collision near the Durrington Cemetery roundabout is causing gridlock on the A27 and A24 this afternoon. Sussex Police and the South East Coast Ambulance Service were called to the junction between Half Moon Lane and the A27, west of the busy roundabout, at 12.30pm today. The accident has partially blocked the main road, causing traffic to build up onto the roundabout and the A24 which it links to. According to the ambulance service, who sent one crew to the scene, both drivers are out of their vehicles and talking. Paramedics are still at the scene to assess if they need further hospital treatment. Traffic reports suggest the accident is causing delays on the eastbound lane of the A27 as soon as you enter Worthing. Westbound, the traffic also appears to be backing up past Lyons Farm. As of 12.50pm, recovery teams were notified and were on their way to the scene to move the vehicles, police said. Police said that while both lanes of the A27 have been blocked, there is still space for traffic to pass.